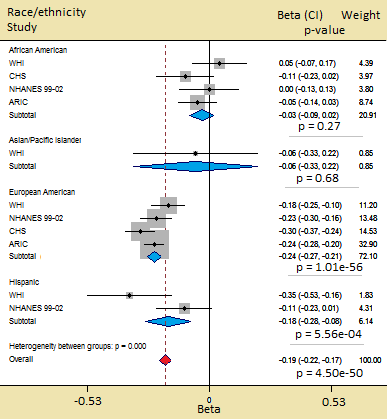 Forest plot for the meta-analysis of SNP rs4420638 and levels of C-reactive protein, across studies and grouped by race/ethnicity. C-reactive protein (CRP) is a blood biomarker of inflammation, elevated levels of which can indicate the development or presence of disease. Inflammatory responses can be triggered by acute events, such as injury or infection, as well as by long-term diseases such as atherosclerosis. In addition to environmental factors, several genetic variants have been associated with CRP levels and other inflammation-related traits. Most of these studies, however, have been performed in populations of European ancestry and have not been as well studied in other race/ethnicity groups. In a recent study published in Circulation: Cardiovascular Genetics, Drs. Jonathan Kocarnik, Ulrike Peters, and colleagues in the Public Health Sciences Division investigated whether inflammation-related genetic variants were associated with CRP levels in various race/ethnicity groups. Results showed both similarities and differences in these associations across race/ethnicity groups, and also identified a novel genetic association with CRP. To perform these analyses, the authors utilized data from 7 studies participating in the Population Architecture using Genomics and Epidemiology (PAGE) study, a large consortium investigating genetic associations with disease across race/ethnicity groups. This large multiethnic resource allowed the authors to evaluate 266 genetic variants in over 40,000 participants in 5 race/ethnicity groups. "This study would not have been possible without the collaboration of so many excellent researchers across studies," said lead author Kocarnik, "and demonstrates the benefits of team science across institutions." In meta-analyses across race/ethnicity groups, 16 single nucleotide polymorphisms (SNPs) demonstrated an association with higher CRP levels. When evaluated within specific race/ethnicity groups, 6 of those SNPs were associated with higher CRP only in European Americans, while 9 SNPs were also associated with elevated CRP in African Americans and/or Hispanics. For 1 SNP, the association with higher CRP was seen in African Americans and Hispanics, but not European Americans. Many of these SNPs had not previously been associated with CRP in non-European populations. According to senior author Peters, "our findings are very important as they showed that not all tagging SNPs generalize to non-European populations, and that other approaches are needed." In addition to supporting and expanding upon previous findings, the authors also performed pleiotropy analyses in 250 inflammation-related SNPs. These analyses identified novel associations with CRP levels for two SNPs in the CELSR2/PSRC1/SORT1 locus which had previously been associated with coronary artery disease and LDL cholesterol. These findings demonstrate the value of evaluating SNPs previously associated with related phenotypes for additional pleiotropic relationships. "Identifying such pleiotropic relationships could be useful for elucidating shared mechanisms or pathways between diseases," said Kocarnik. While effect size estimates for the SNP association with CRP were generally consistent across race/ethnicity groups, for several SNPs a larger effect was seen in one group than in the others (see figure). Additionally, there was also variation in the associations for different SNPs in the same locus. Identifying such similarities and differences could be important for ensuring the appropriate translation of genetic information, particularly in the context of health disparities. "Expanding studies from European descent to minority populations is critical," said Peters, "as otherwise the gap in health disparities would be even further increasing." Moving forward, the authors are continuing to investigate the similarities and differences in the genetic underpinnings of disease across populations. The findings from this study, said Peters, "have shifted our entire research approach towards conducting substantially more comprehensive fine-mapping studies." Using higher-density genotyping platforms such as the Metabochip, the authors hope this approach will continue to ensure that the benefits of new genetic findings will be accessible to all populations. Other PHS investigators contributing to this project were Drs. Cara Carty and Andrea LaCroix. Kocarnik JM, Pendergrass SA, Carty CL, Pankow JS, Schumacher FR, Cheng I, Durda P, Ambite JL, Deelman E, Cook NR, Liu S, Wactawski-Wende J, Hutter C, Brown-Gentry K, Wilson S, Best LG, Pankratz N, Hong CP, Cole SA, Voruganti VS, Bůkova P, Jorgensen NW, Jenny NS, Wilkens LR, Haiman CA, Kolonel LN, Lacroix A, North K, Jackson R, Le Marchand L, Hindorff LA, Crawford DC, Gross M, Peters U. 2014. Multiancestral analysis of inflammation-related genetic variants and C-reactive protein in the population architecture using genomics and epidemiology study. Circ Cardiovasc Genet. 7(2):178-88.